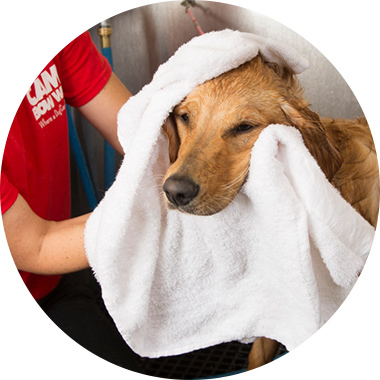 Contact us at (832) 482-2299 to learn more about our dog grooming services. If your camper has a special coat, is difficult to handle, or is a giant, we may charge a small fee due to the additional time required to complete the service. Best Value! - Go from simply bathing to full-service de-tailing with our most popular add-ons for one price! Shorten and round-off your dog's nails. Freshen Fido's breath and reduce bacterial build up using a dog-friendly enzymatic formula. Counselor uses cotton balls with a mild solution to get rid of any unwanted gunk in the ears. Remove excess hair and smooth the coat with a 15 minute Furminator brushing.